"With a Vengeance!" - Chapter 6: "Supermen/Batmen"
Kara, Power Girl and the rest of the Supergirls free Superman from the Source Wall. They quickly join up with Batman, the alternate Batwoman and Superwoman, who are not only facing the Maximums, Lex Luthor, Darkseid, an evil doppelganger of Supergirl and the possessed Superboy but the two that are manipulating everything; Mr. Mxyzptlk and the Joker. The fight is fast and vicious with both sides gaining ground and then losing it. Bizarro #1 arrives with an army of alternate reality Supermen and Batmen. The imperfect duplicate finds the body of Batzarro and uses the Blue Kryptonite ring the defective Dark Knight detective kept in his utility belt, which gives him an elevated twelfth-level intelligence. Bizarro quickly realizes what needs to be done and flies off. The game between Joker and Mxyzptlk continues. 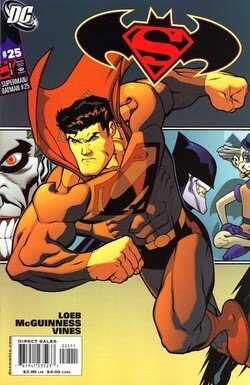 Mxy merges all of the various Supermen and Batmen into one Composite Superman-Batman. The Joker quickly counters by amalgamating the Maximums and the two combined heroes begin to duke it out. Bizarro quickly returns with a device to place Batzarro in a Stasis Zone in an effort to rescue him from death. 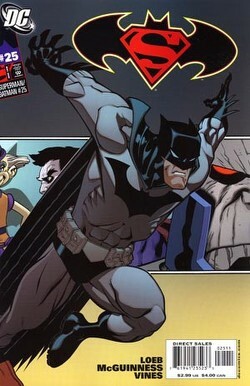 The device has another effect and releases Bat-Mite, who had been trapped in the Joker's mind. Mxy and Bat-Mite explain what has been going on and Mxy quickly puts everyone back where they should be with no memory of what happened. Before putting Superman and Batman back Mxy tells the two that the game was a test to get them ready for the crisis to come and to make them realize how important they are to each other. The two heroes are left to mull over what happened. Meanwhile Darkseid asks Mxy what role he is to play in the coming crisis. Mxy tells him he doesn't have one and that they have a future together that has yet to be revealed. Darkseid is curious but Mxy will only give a cryptic hint about the events that will bring them together. Story - 4: Even though Jeph technically has an issue to go I will still begin this review by writing that if Loeb was going to leave the series this was definitely the final story to do. Even though he left the door wide open for him to return to the title sometime in the future this still had the last episode of the season feel to it. A good last episode too. A Lana is caught in a tornado and Clark runs into ending, not a Clark gets trapped floating naked in the fetal position ending. At least I hope you do because at this point even I'm a little confused. What I'm not confused about is how rock and roll this chapter of "With a Vengeance!" was. Jeph really pulled out all the stops as he not only had a meeting of the Supergirls but also pulled a Zero Hour on us and threw in variant Supermen and Batmen. All of this and Bat-Mite too. What impressed me about the story was that Loeb was able to keep the chaos fairly contained. There was a natural progression to the insanity and it was almost like a bunch of fans sitting around a camp fire telling one segment of a story and ending with the most insane problem or predicament possible to stump the next guy or gal. It was a series of really neat moments with a solid foundation and I liked and appreciated that. It was the scene where Mxy drove home the point that Jeph had been trying to make that made this story arc special. Mxy's desire to not only regain his lost power but also prepare Superman and Batman for Infinite Crisis worked together to produce a wonderful read. I could be reading way too much into the work but it seemed that he was not only illustrating how important Superman and Batman are to their own fictional world but also how important the two were to the comics industry. It was almost as if Jeph was saying that all of the super-heroes that came after the Golden-Age owe something to Superman and Batman. Those little moments I described were great as well. My favorite had to be Bizarro inadvertently freeing Bat-Mite. I've never been the biggest Bat-Mite fan, but in all honesty if you are going to bring Mr. Mxyzptlk into a World's Finest type story you need to include Bat-Mite and instead of shoe-horning him into the narrative Jeph brought him in organically. Add to that how Jeph wove the Joker and Lex's role in the stories before Infinite Crisis and I was a very pleased continuity minded reader. I could honestly write about each and every bit of business I liked but it would take too much time. Suffice to say that the Superman Family scene, the hoards of Supermen and Batmen and the Composite Superman-Batman all made me very happy. As much as I believe that he will one day return to Superman and Batman I am kind of sad to see Jeph go. I know he left things in such a way that he could come back and do another arc but at the same time I enjoy how Jeph writes these two characters and there is a part of me that doesn't want it to end. He never did what was expected and took some chances, Supergirl being the most daring of ideas given how readers (myself included) reacted to Linda Danvers going into retirement and the whole Cir-El debacle. There was and is a certain contingent of readers that have been hostile to Loeb's storytelling sensibilities and I think a lot of it was unwarranted. Superman/Batman was always a book where anything, no matter how out there an idea, could happen and that made it stand out from the rest of the Superman and Batman titles. I'm going to miss that. I think Mark Verheiden is going to do a wonderful job but part of me will miss Loeb on this title like I miss Peter David writing Young Justice. I know in my head that these things happen, but it still doesn't make it any easier. Come back soon, Jeph. You will be missed, by me anyway. Art - 4: I'm going to miss McGuinness and Vines too. They really met the challenge that Jeph threw down with his script and did some great page layouts. There were certain shots, like Superman getting pulled from the Source Wall, that were awesome on a visceral level but having the Joker and Mxy watching the events unfold on a cube (on a two-page spread no less) was just great. There were a lot of characters thrown into this story and they all looked good. I especially liked the alternate Superman and Batman designs. Hopefully Ed and Dexter will return to these pages at some point but for now we're left with an issue and story arc that had some really fantastic art. Like I wrote in the story review anything could happen in this storyline and every time Ed and Dexter rose to the situation to make those events look good. Thanks, guys. It was a fun ride. Like Jeph I hope to see y'all soon. Cover Art - 5 (both): It's kind of hard to judge both covers separately considering it forms a single image. So I'm going to break away from convention and look at the piece as one giant cover. Unlike the alternate covers to the first issue of this title each hero gets their own with the background linking the two pin-up shots. DC has done a wonderful job of releasing solicitation images that don't match the cover as it is published. In this case it was important since the Bat-Mite shadow behind Mxyzptlk would have blown that particular plot bomb. I also appreciated the fact that Ed and Dexter flipped the villains and imperfect duplicates so that Superman was with Batman's and Batman was with Superman's with Mxy and Bat-Mite in the middle. It was also interesting to see that Superman had a lot of light on him while Batman was bathed in shadow. It might be considered clichéd, but I liked it. The shading or lack of it, made sense for the characters involved.